Even though modern medicine has other plans when it comes to overall health, fasting and colon washing, nobody can deny the fact that our bodies are exposed to toxins, and that the elimination of such toxins only provides great benefits. 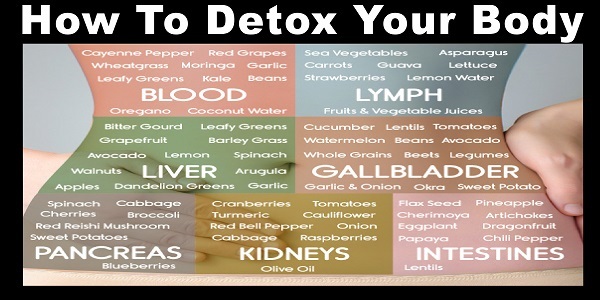 Detoxification treatments always target organs that are in direct contact with the toxins that enter our body, including the liver, kidneys, intestine or colon. Liver is known as The Great Detoxifier. It accepts all the noxious chemicals and fats we eat and turns them in material that can be later excreted by the body. But, your liver sure needs a little detoxifying itself. Alcohol, non-steroidal anti0inflammatory drugs (NSAIDs) and diabetes mostly affect liver. They cause injuries and inflammations, and stop this organ from functioning properly. Bitter gourd is a natural product that detoxifies the liver, eliminating the effect of alcohol, NSAIDs and diabetes. This fruit reduces the liver oxidation and inflammation caused by alcohol, and it stimulates the scavenging of liver free radicals caused by diabetes. It also increases the glutathione level, which alleviates inflammation caused by NSAIDs. Eat more lemons, avocados, apples, dandelion leaves, and garlic to detoxify and rejuvenate your liver. Kidneys are better known as blood filters. They collect and eject toxins from the blood. However, they are vulnerable to toxins like drugs, microorganism infections, and excessive calcium or blood sugar. Cranberry juice is excellent when it comes to kidney detoxification. Scientists say that cranberries combat viral infections and calcium deposits. Onions counteract kidney toxicity from cadmium intoxication. They are also effective in the treatment of renal Toxoplasma gondii infections. Once our stomach muscles mash up the food into a liquid, the small intestines absorb all the nutrients and send them to the bloodstream, and they are later sent to the rest of the body. the waste material is pushed into the large intestine -- the colon. Practically, colon is body’s trash can. Just imagine how disgusting it can be if it is not regularly cleaned and emptied. The bacteria-filled waste can seriously damage our body and its functions. Lentils are known to be effective in this aspect, and they are an excellent colon detoxifier. You do not need to go for a colonic irrigation if you feel like washing out your colon. Most doctors do not recommend colonics, as it increases the risk of bowel perforation, infection, and electrolyte imbalance. Pineapple juice can do the work! It is packed with vitamins and fiber, which make it efficient in the cleaning process. It is often given to patients before they undergo a colonoscopy procedure, so they can clear their colon. And last, but not less important, encourage the growth of beneficial microorganisms in the colon. Eat globe artichokes for that purpose. Although modern medicine supports other aspects when it comes to this issue, there is rich scientific evidence that supports common ways of detoxification -- through eating healthy food and avoiding unhealthy, chemical-loaded foods. However, some foods are healthier and more powerful detoxifiers than others, and it is good to know which foods provide the greatest benefits and health properties.